*Before you pay us to do your transposition, click on the Online Sheet Music link below or enter the title in the search box and press your return key. 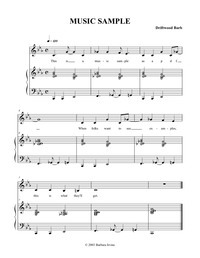 �Digital sheet music downloads are available 24/7, in any key. �If a transposition of your song is not available on their site, we will be happy to do it for you. For very reasonable prices on sheet music that you do not need to have transposed, go to Sheet Music Plus by clicking on the logo below. �� � � ��Whether copied from your handwriting or already printed sheets, or taken down from a recording, you can rely on Barbara's musicianship and experience to provide you with detailed, clean, and accurate printed music. Just let us know if you want lead sheets, charts, or full scores, and we will accommodate you. �All the services below are available via email (pdf), fax, or regular mail. �A sample of our work is shown to the right. Song Sleuthing - Can't find a song you've heard? Do you have a recording of the song but can't find the sheet music? For a modest fee we will track down the sheets for your song. If we can't find it, we will transcribe it from your recording and we'll charge you only for the transcription, not the search. Songwriters and composers - We'll make your handwritten music into beautiful printed scores. If you have recorded your music, but haven't written it down, we'll transcribe it from your tape, CD, or mp3. Editing and proofreading - We work in both Sibelius and Finale, and can clean up and format your existing scores in either program.